A number of listeners and readers have asked about the apparent disparity in the so-called "shark fins" used by Sprint Cup teams last weekend at Martinsville Speedway. 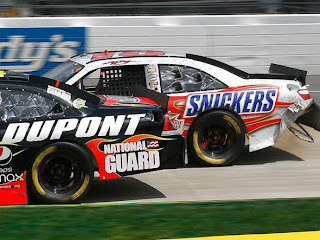 As illustrated in the above photo, some teams (like Kyle Busch's) elected to use the full-length fin, running from the top of the rear window to the rear spoiler. Others (like Jeff Gordon's Dupont Chevrolet team) ran smaller fins, or no fin at all on the trunk lid. NASCAR spokesman Ramsey Poston provided a clarification of the new rule today, saying that the rear deck fin will not become mandatory until the series races at Texas Motor Speedway on April 18. Fins will be mandated to be 3.5 inches tall, and must be at least 17 inches in length. Teams may run any length fin from the 17-inch minimum to the full 25-inch version, tailoring the length to help fine tune the handling characteristics of their cars. Full (25 inch) fins will be mandatory at both Talladega and Daytona. It’s Monday morning in Martinsville, Virginia. The 7:15 AM coal train just rolled through, rousing a few thousand fiercely determined, never-say-die race fans from a fitful, thunderstorm plagued sleep. Most of their buddies packed their bags and headed for home 12 hours ago, not long after NASCAR ran up the white flag of defeat and postponed the Goody’s Fast Pain Relief 500 from Sunday afternoon to high noon Monday, due to rain. It’s a familiar story to longtime Martinsville fans. Late March in the Commonwealth of Virginia is always a crap shoot weather-wise. One day it’s sunny and 75 degrees; Chamber of Commerce weather. The next day is rainy, cold and bleak with temperatures in the low 50’s. See you Monday, everyone. Martinsville Speedway deserves two spots on the NASCAR Sprint Cup Series schedule, and there are plenty of reasons why. Martinsville doesn’t have a catchy advertising slogan, because it doesn’t need one. Fans know that when they plunk down part of their hard-earned paycheck at Clay Campbell’s ticket window, they’re going to get one heck of a race in return. And maybe a couple of those one-of-a-kind hotdogs. There’s no Hollywood back lot pre-race extravaganza at Martinsville. Nobody stages a mock invasion of Afghanistan, nothing explodes, and nobody jumps a school bus over a troop of Cub Scouts for your viewing pleasure. They just introduce the drivers, do a little singin’ and prayin’, then get on with the race. Whitney Houston doesn’t sing the national anthem at Martinsville. That spot is reserved for the local High School band, which annually delivers one of the best and most respectful renditions of the season. I understand that it’s important to grow the sport. I understand that fans with Rolex watches and personal assistants spend more money on race day than the guy who spent the night sleeping in a tent in the mud. I get that the fancy new speedway with the casino in Turn Two is going to impact the parent company’s bottom line more positively than an antiquated half mile with railroad tracks just off the backstretch. But I also understand that image is not as important as substance, and that a glittering facility and a fancy press box do not make up for a crappy race. You don’t have to wait for the post-race media availability to find out how your favorite driver’s day went at Martinsville. Just watch for the inevitable post-race shoving match. You don’t hang out after the race to catch the free Peter Frampton concert at Martinsville. You head for the car and watch some guy in a homemade off-road pickup truck pull people out of ankle-deep mud for $50 a pop. That’s quality entertainment. That’s Martinsville Speedway. Give me a racetrack where the best restaurant in town isn’t a soulless chain with 57 big-screen TVs on the wall, but a joint with vinyl booth seating that just happens to sponsor the five-time National Late Model champion. Give me a track where half the field finishes with its front fenders no longer attached, and where marketing still plays second fiddle to racing. Give me a track where the man in charge is the grandson of the man who built the place with his own hands. Our sport is sadly overstocked with perfectly polished, stainless steel, 1.5-mile tri-ovals that have more corporate suites than cheap seats. We’re up to here with cookie-cutter, single-file, aero-push speedways that have all the charisma of a Ben Stein economic dissertation. We have too many International Motor Speedways, and too few racetracks. 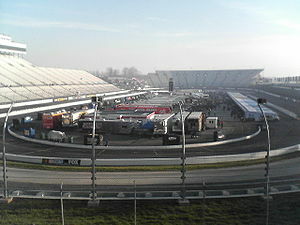 Martinsville is a racetrack; a motorized Fenway Park in a Safeco Field world. And it must be preserved. Lesa France Kennedy -- if you’re listening -– please leave Martinsville’s race dates alone. We don’t mind the rain, the mud, or the 7:15 AM coal train alarm clock. We cherish the tradition that permeates every inch of those rolling Virginia hills, and think it’s important to be reminded where we came from, if only twice a year. The MRN Gang invades the Barney Hall studio for a surprise birthday celebration. Ms. Stephanie presents the goodies to the Birthday Boy. For once, Dave isn't quite sure what to say! 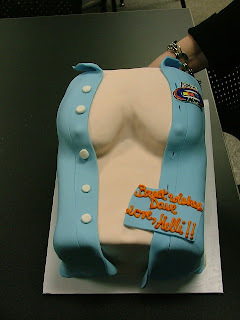 The infamous MadCan "Boobie Cake." It tasted good, too! Jimmie Johnson did it again Sunday, lurking in the shadows for much of the day while others dominated the Food City 500 at Bristol Motor Speedway, then slicing his way through the field when the chips were down to claim his third checkered flag in five starts this season. Sunday’s win was the first of Johnson’s career at Thunder Valley; a track where his best finish in 16 prior starts had been third. He and crewchief Chad Knaus circled the race in red before the 2010 campaign began, and crossing another track off his personal hit list clearly had Johnson pumped-up in Victory Lane. "It's about time," he said. "We’ve been off here over the years, but we focused on what we had to do and overcame it." While Johnson, Knaus and company high-fived in Victory Lane, portions of the NASCAR garage and much of the grandstands were left fuming. "I'd rather lose to any of the other 41 cars out there than the 48 car," said Kurt Busch, who led 278 of 500 laps Sunday before Johnson once again motored away to victory when it mattered most. "I thought we had him beat. I gave it my heart today, but we came up short." “We’ve been able to get in some guys’ heads, and that’s been helpful,” admitted a grinning Johnson when told of Busch’s comments. He then added a warning to the rest of the competition, saying, “When we're winning at tracks that we're not supposed to (win at), boys better look out. Even that #2 car (Busch) that doesn't want the 48 to win." Johnson has now won at all but five NASCAR Sprint Cup venues; Michigan, Chicago, Homestead, Watkins Glen & Infineon. 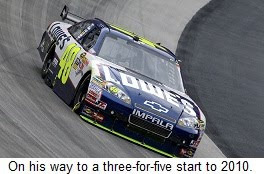 He also became only the 12th driver in NASCAR history to win 50 career races. Three of the previous 11 drivers are headed to the NASCAR Hall Of Fame as members of its inaugural class. Six others were Class of 2009 HOF nominees and the other two – Jeff Gordon and Rusty Wallace – are sure bets for the Hall at some point in the not-too-distant future. Only three men have ever reached the illustrious 50-win plateau faster; Darrell Waltrip, David Pearson and Gordon. If his career ends now -- without a single additional win -- the Lowe’s Chevrolet driver should be a first ballot Hall Of Famer. His 50 career Cup wins tie him for tenth place on the all-time list with NASCAR legends Ned Jarrett and Junior Johnson. His four championships trail only Dale Earnhardt and Richard Petty, who earned seven. Gordon also has four, but Johnson won his four titles consecutively; something that had never, ever been done. By any yardstick you care to use, Jimmie Johnson is the best in the world at what he does, and maybe the best ever. Unfortunately, it gets him nothing but a ration of flak from the fans and snappish, green-eyed envy from his colleagues in the garage. Sadly, excellence is no longer something to be applauded, envied or emulated. We no longer encourage our children to win, having abandoned that archaic practice decades ago. Instead, we award trophies for participation and pretend not to keep score. And when someone like Jimmie Johnson bucks the trend by aspiring to something more than mediocrity, we shout him down for winning more than his share and upsetting our cozy little “nobody wins, nobody loses” view of the world. "Look at the stats, look at the talent and look at the dedication,” said team owner Rick Hendrick of his lead driver at Bristol. “Just look at his record. I don't understand why it's not written (that) he's one of the best that's ever done this. I've been around for a long time, (and) I've watched a lot of guys from Richard Petty on up to current day. "When you look at the level of competition since he's been in the sport, what he's done (and) what he's accomplished, I mean… I don't know what he's got to do." While Hendrick fumed about the lack of respect afforded his four-time champion, Johnson seemed to revel in it. Asked about the “'Anyone But Jimmie” mentality that threatens to take NASCAR Nation by storm these days, the Lowe’s Chevrolet driver said, "It's awesome. People used to say `Anybody but the #3, anybody but the #24.’ I'm proud to be in that category"
Up next for Johnson? 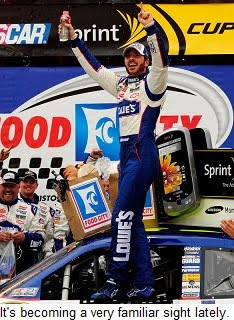 Sunday’s Goody’s Fast Pain Relief 500 at Martinsville Speedway, where he's won five of the last seven races. Get used to it, folks. Jimmie’s not going anywhere. NHRA Top Fuel drag racer Doug Herbert will hold a charity poker tournament to benefit his B.R.A.K.E.S. (Be Responsible and Keep Everyone Safe)program on March 23 at Ray Evernham Enterprises. Herbert founded the non-profit teen driving school after the deaths of his two sons in a single-car highway crash in Cornelius, NC. B.R.A.K.E.S. offers its Teen Pro-Active Driving School free of charge to every family that wishes to take part. With support from the National Hot Rod Association, B.R.A.K.E.S. will provide hands-on training to at least 1,200 teenagers this year, expanding its initial reach outside the Carolinas to California. Herbert said he has had request from parents around the country to bring the program to their states. "Our hope is that, through fundraisers like this, we will be able to take the school to even more areas of the country next year," he said. The tournament will begin at 6:30 p.m., with the first hand dealt at 7 p.m. Entry is $250 per person, which includes buy-in, dinner and three drinks. The event will also include a raffle and entertainment. Players will receive an additional $250 in chips for bringing a non-playing guest for an additional $40 donation. Players may register by calling (704) 732-8950. For more information on B.R.A.K.E.S., visit the organization's website at http://www.putonthebrakes.com. Blake Shelton (L) exhibits his massive Man Crush for the Godfather at the 2008 Sadler Barn Party. Shelton's song "Hillbilly Bone" (with Trace Adkins) is #1 on the country charts this week. Way to go Shelton! No matter where you stand on the Carl Edwards/Brad Keselowski feud, the incident spotlighted at least three indisputable facts. Both drivers learned a valuable lesson. There is no single correct point of view when it comes to NASCAR’s new “Boys, Have At It” approach to on-track conduct. In terms of luck, Keselowski was fortunate to walk away from a crash that left the A (windshield) pillars of his Penske Dodge badly crushed and brought the roof on his car to a point at mid-windshield. Edwards was fortunate that his intentional takeout caused no injuries, either to Keselowski or anyone in the grandstands. One can only imagine the feeling in the pit of his stomach when he rolled past the shattered remains of the #12 Dodge and saw the aftermath of what was supposed to be a simple spin through the grass. In the “lessons learned” department, Edwards almost certainly learned the importance of maintaining one’s composure at 180 mph, and the value of saving one’s paybacks for a more suitable venue like Bristol or Martinsville. He also learned that white driving gloves can come back to haunt you in the aftermath of an ill-timed right turn on national television. Keselowski, meanwhile, learned that every action produces some kind of response. While aggression is an important quality in a NASCAR Sprint Cup Series racer, the ability to properly time that aggression is also critical. Keselowski almost certainly grasps that concept better than he did two weeks ago. He also learned that new kids on the NASCAR block are expected to spend a certain amount of time learning the ropes from their more-experienced peers before jumping lead-first into the deep end of the competitive pool. Nobody’s saying to pull over and wave `em by with 10 laps to go, but a little lift here and there when things get tight in the first half of a race puts a rookie driver in much better favor with his colleagues. In terms of opinion, there was (and still is) no shortage of it in the aftermath of the Atlanta crash. The commentary ranged from “Edwards is a homicidal maniac who should have been charged with attempted vehicular homicide,” to “Keselowski’s a punk that had it coming” and virtually all points in between. Indeed, both drivers will join their car owners and crewchiefs in a mandatory “air clearing” session with NASCAR’s top brass prior to this weekend’s opening practice at Bristol. The specifics of that meeting will likely never be revealed publically, but those who have attended similar functions in the past say it is likely to be loud, profane and emotional, capped by a stern “Come To Jesus” statement from NASCAR that should prevent the situation from escalating any further. In the end, the Great Crash of 2010 provided a much-needed promotional boost for the sport, a chunk of videotape that will be replayed for decades to come, a heaven-sent ticket selling opportunity for Bristol Motor Speedway and a hot new rivalry between two of NASCAR’s most marketable young drivers. In the end, it could have been worse. Angelle Sampey announced today that she will hang up her helmet and leathers and retire from the sport of drag racing. Longtime Sirius Speedway listeners know Angelle as a three-time NHRA Pro Stock Motorcycle World Champion and a good friend of the show in its early years. She will focus on her new aquarium supply business and starting a family with her fiancé Seth Drago, who she will marry in June of this year. "I'm ready for a new challenge," she said. "I made the ultimate sacrifice to postpone starting a family when I began racing. Now, I'm going to make the ultimate sacrifice to stop racing to get married and try and start a family. "I will take away so many great memories from racing," said Sampey. "I'm certainly going to miss being around my fellow racers and, of course, the fans. I really enjoyed meeting the fans at every race. They were always there for me through the good times and the bad times." In her 13-year NHRA career, Angelle won 41 national events en route to those three World titles, recording an unprecidented 364 round wins in 506 trips; a winning percentage of approximately 72 percent that allows her to retire as the winningest woman in the history of organized motorsports. She also provided us with as many laughs as any guest in the history of Sirius Speedway. We’re sorry to see her go, but we wish her all the best and look forward to some good news on the baby front, as soon as possible. Highlights Of Pedicure Day On Sirius Speedway! The lovely Lia begins hacking away at the Godfather's piggies. 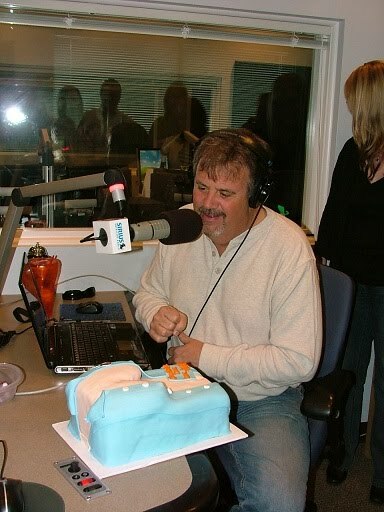 Ray really seems to be enjoying this! The finished product: Dave's Green/White/Checkered polish job! Ray's "Ronald McDonald" polish. (The man has monkey toes). Ray, Lia and Dave at the end of the day. Thanks to Elena's Spa and Salon in Concord, and to all the listeners who allowed us to donate over $7,000 to Ronald McDonald House of Charlotte. You're the best! The Concord (NH) Monitor reported Friday that New Hampshire Motor Speedway is lobbying to build a casino, hotel and racing museum on the grounds of the Loudon oval, if state legislators legalize gambling in the Granite State later this year. The New Hampshire state senate is currently considering a bill that would legalize “limited gambling;” allowing video slot machines and table games at six sites across the state. Until last week, NHMS was not believed to be part of their plan. 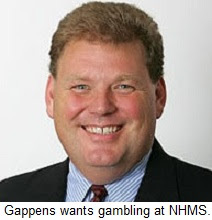 But NHMS Executive Vice President and General Manager Jerry Gappens revealed Friday that the track has hired consultants to design an on-site casino and determine the financial impact it would have on the track, the town and the state. “We want a seat at the table because we know we could do a good job and be a responsible partner with the state,” said Gappens. “We're the largest sports and entertainment facility in all of New England. We've got a great infrastructure here. And (gambling) would compliment what we already do." The current bill calls for limited gambling at six specific locations; a trio of existing horse racing facilities in Belmont, Seabrook and Salem, two new sites in the northern part of the state and a proposed new country club in Hudson, NH. The bill would have to be amended to include the Loudon oval, but Gappens said the speedway’s track record of hosting major events makes it a strong candidate for inclusion. NHMS is just five miles from the Belmont venue, and Rick Newman, a lobbyist for the Lodge at Belmont, said it is unlikely both facilities would be included in a final draft of the bill. He strongly criticized Speedway Motorsports, Inc. – owners of NHMS – for being a late entrant to the discussion, and for having no experience in running casinos. "We're already in the gambling business, and we have survived in an economy that has been very hard on our business," said Newman to the Monitor. "We've been a partner with the state for four years, and at this location for almost 25 years. We're not Johnny-come-lately with a big bag of money saying, 'Let me kick the door down.' Having cars turn left for 3½ hours isn't the same thing as running a casino." The current wording of the bill calls for a total of 17,000 slot machines, split among six facilities. Table games – blackjack, poker, etc. – would also be legalized, but only after an additional licensing fee is paid by each venue. The first $50 million in revenue would be used to fund social service programs statewide. The measure is not without its critics. Jim Rubens, head of the Granite State Coalition Against Expanded Gambling, told the Monitor, “This just shows what will happen when the door to gambling opens. This state will be crushed with gambling problems in every community, and the whole notion of limited gambling is gone." Dover International Speedway is currently the only NASCAR Sprint Cup Series track to feature an on-site casino, but International Speedway Corporation recently announced plans to partner with Penn National Gaming, Inc., to build and operate a year-round casino on the grounds of Kansas Speedway. State and local officials recently awarded ISC and Penn National a gaming license and management contract to operate that casino, and ISC Chief Executive Officer Lesa France Kennedy has said she will petition NASCAR to realign a second Sprint Cup Series date there no later than 2011.